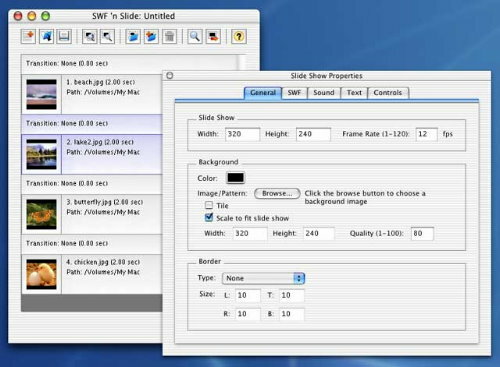 SWF 'n Slide Pro offers the same features as the standard edition, but also allows you to create other types of slide shows including scrolling thumbnails and 3D flip books. See our Features Chart showing the differences between the Standard and Pro Editions. Download the FREE trial version and see how fun and easy it can be. Output Macromedia Flash movie files (SWF).Over 97% of all browsers already have the Flash Player installed, so you won't have to worry about your audience being able to view your slide shows. Add audio to individual slides to add sound effects, narration or background music. Add captions with your choice of font, color, and size to narrate your slide show. Add animated text effects with Text-Osterone (Animated Text Effect Software). Add playback control buttons to your slide show for pausing/playing the slide show or skipping to slides within the slide show. Add a preloader to enable smooth playback over the Internet. Add preloaders created with SWF, Lock & Load (Flash Preloader Creator). Add mouse click actions to open web pages, load external SWF files, and navigate through the slide show. Save project files so you can save your work to allow you to make changes to an existing slide show over time.